The industrial age, at least for Britain, may be on the wane, but the attractions bringing our industrial history to life are doing a roaring trade. Nobody is ever likely to create or visit a museum of derivatives trading, but people are fascinated by how things were made, by how we progressed from an agricultural and craft economy to be for a time the world’s manufacturing heart. It would be a mistake to think of our industrial heritage as starting only during the industrial revolution. One site that puts things into perspective is Grime’s Graves, a few miles to the north west of Thetford in Norfolk. Here you can climb down a 9m shaft to view the flint mines excavated by our ancestors some 5,000 years ago. They are believed to have used deer antlers as digging tools to get to the high quality flint that napped perfectly to make the sharpest cutting tools then available. Mining declined hugely in importance in Britain over the last century, which perhaps makes it all the more important for us to make the effort to understand what was done to get at our natural resources, and what is still done by those remaining in the field. There are plenty of such places on offer. For example, the Welsh Slate Museum near Llanberis gives an insight into an industry still operating in various regions, with demonstrations of slate splitting and activities to keep kids interested. Geevor Tin Mine, which was still in use commercially until 1990, provides a contrast from the beautiful beaches and pretty villages for visitors to Cornwall’s Atlantic coast. There is a museum on the surface, but it is the guided underground tour that could be a real eye opener for many. Once the natural resources had been sourced, they had to be processed. The ironworks at Taynuilt in Argyll date from 1753, and the displays at the site give visitors the chance to see how iron was made in this charcoal fuelled factory. Jumping forward in time, and taking us from iron to steel, the magnificent Magna in Rotherham is something not to be missed. The blast-furnace display is truly awe-inspiring, a vision of hell in a flash. And the thinking that has gone into the site makes it a must-see place – the kids get plenty of hands-on time, and a fair amount of water-on too. What then was the iron (and later steel) used for? 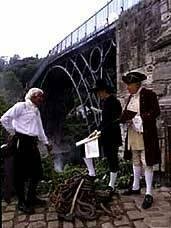 There is no better place to get a grasp of that stage than Ironbridge in Shropshire, where Abraham Darby cast the iron to make the world’s first iron bridge, which changed transport and communications forever, and demonstrated just what could be done with cast iron, opening up the minds of our engineers to its possibilities. Ironbridge, near Telford, is a world heritage site, and the various museums within close proximity of the famous bridge make for a full day of visits to the area with minimal driving (or walking) between. The next stage was the steam age, thanks to the easily worked materials making the construction of the boilers and pistons feasible. Steam engines can provide hypnotic introductions to the technological world – they even smell right somehow. Strumpshaw Steam Museum to the east of Norwich has a fine collection of steam engines including a 100 ton beam engine in working order, but even that is trumped by the Cornish beam engine which used to pump water for the western part of the capital on display (and in operation) at Kew Bridge Steam Museum in Brentford, London. Industry is of course not all iron, steel and steam. It can produce the finer things in life too. The Heritage Centre and Silk Industry Museum in Macclesfield, Cheshire, provide a wonderful glimpse of the industry that linked the eastern and western worlds. Rather lower down the fashion scale came cotton, the industry that created vast fortunes in the 18th and 19th centuries in this country, and The Museum of the Lancashire Textile Industry, in Helmshore (between Bury and Blackburn) has two mills on the site, one showing the world of king cotton, the other the processing of cloth, with a waterwheel providing power. But for the really fine things in life though, a trip to Scotland may be in order. How about a trip to the Dallas Dhu Distillery in Forres, Morayshire, to see how whisky is made, surely worth the effort. And a long way south, in the Borders town of Innerleithen, there is something for the mind rather than the stomach, with the carefully preserved Robert Smail’s Printing Works there. Finally, two sites that bring so much of our industrial past together must be mentioned: Abbeydale Hamlet in Sheffield, and Saltaire near Bradford, both of which give a wide view of life and work in the industrial age, rapid induction courses into the glories and the grime of the times.